Formulated using a blend of Acetyl L-Carnitine and Alpha Lipoic Acid, the makers claim high levels of effectiveness with this supplement. Alpha Lipoic Acid is a vitamin type chemical that acts as an antioxidant, commonly found in foodstuffs like broccoli, spinach and potatoes it has a large number or reported uses. These can include anything that can cause cell damage, and examples include diabetes, lyme disease, heart, liver and blood disease and some eye problems. Nothing of any consequence, a few people might develop a rash, and in isolated cases, it could reduce blood sugar levels. The supplement form of Carnitine, a naturally occuring amino acid, Acetyl L-Carnitine (ALC) is a common addition to many male supplements and has a wide number of uses. Clinical Studies have shown that a daily dose of Acetyl L-Carnitine can have a positive affect on both the pain and the amount of curvature caused by Peyronies Disease. It can interact with some medications, so if you are taking long term medication its always best to consult your doctor before taking any form of supplements. This is not cheap….. it can be brought directly from the makers – Global Nutra Labs, they sell a bottle containing 120 tabs for $87.00 (this is enough for either 1 or 2 months depending on desired dose – you can take between 2 and 4 tabs a day. The two ingredients in Alignol do themselves have some proven benefits in the treatment of Peyronies disease, that said, the makers (Global Nutra Labs) have had less than positive feedbackk, with adverse comments being placed on some very respected Peyronies forums, phrases such as ‘scam’ are being mentioned. They do not seem to offer any consumer protection such as a cash back guarantee. 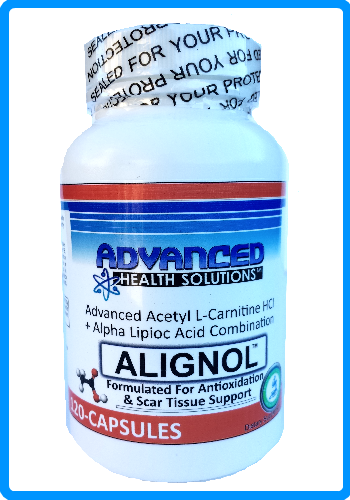 Have You Used Alignol? Did It Work For You?